I’ve been painting since 1991. It has paid my bills since the late ‘90s. And it turns out the reality of being a working artist isn’t what most people expect. It’s not what I expected. In that way, it’s similar to one of my paintings — the end result is rarely what I anticipated. I’m a Texas native currently based in Dallas, but I don’t think my work reflects my environment much at all. I’m drawn to texture, color, and character. While Texas certainly doesn’t lack character, most of it near me is tan or green and generally flat. I love to travel, but I find that I’m still able to squeeze some creativity out of my familiar surroundings. 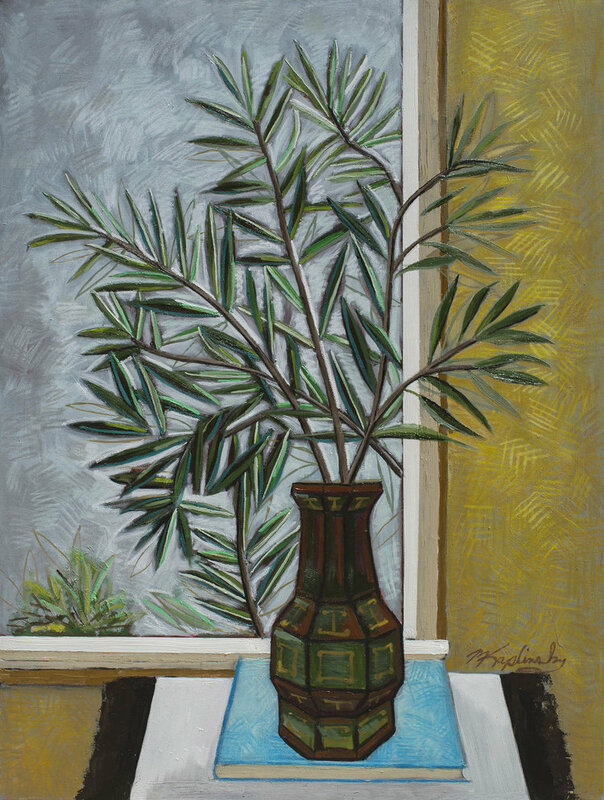 One of my favorite artists, David Bates, is also a Dallas resident. He’s a major source of inspiration for me, illustrating that you can be creative wherever you are. My work oscillates between a style that’s representational and one that’s more abstract. Some of my pieces directly reflect my inspiration: A painting of a leaf that looks unmistakably like a leaf. Some are less straightforward: A mixed-media piece with paints, pastels, paper, glue, fabric, ink, and more, that doesn’t particularly resemble anything. Sometimes I wonder which style defines me. Maybe I don’t have to choose just one — Gerhard Richter hasn’t. The experience I’ve had as a working artist defies almost all stereotypes. When you tell someone you’re a painter, they immediately assume that you’re not busy, you stay up all night and sleep late, then you play video games all day. For me, that couldn’t be further from the truth. My schedule surprises people. I work 10-12 hours a day, 5-6 days a week, and I start as early as 5 am. I try to put all of my energy into how I can improve and learn from my mistakes. You have to make a lot of mistakes before you’re good enough to get into high-end art galleries. Prospering as an artist involves a surprising amount of networking — going to shows, galleries, and art fairs. If you’re not willing to socialize, it’s going to be difficult to gain exposure or make the connections needed to succeed. Like any other industry, the art world can be a popularity contest. An aspect of this job that does meet expectations is the undefined lifetime of each project. Some pieces take a few days to finish while others go through several iterations over the course of a year. When I finish a piece, sometimes I have a buyer within days and sometimes it isn’t sold for four years. I consider myself an eternal optimist, which comes in handy when faced with the nerve-wracking grind of being an artist. Putting together a sales proposal and waiting for a sale to close only for it to fall through is heartbreaking. I stay sane by focusing on self-improvement. I feel confident that as long as I’m trying my hardest, I’ll get better. The art market can be wildly unpredictable, so the only thing I can count on is my work ethic. When I first started painting, I was living out of my car. Since then, I’ve produced more than 1,000 paintings – something I could not have predicted. You can view my work here.